Mansion 1907 is a 110-year-old mansion, converted into a hotel in Mysore. Enjoy the peace and the cultural beauty that is Mysore, while paying INR 500 a night to stay in a mansion. From bunk beds to private rooms and a host of activities to do, this place is an ideal weekend spot to chill with friends or your SO. Built as a big residence in 1907, for a businessman, Mansion 1907 is a backpackers and solo travellers paradise. Staying in a large 110-year-old mansion, with a mix of Indian and British, while paying so less for so much, sounds like a win-win to us. 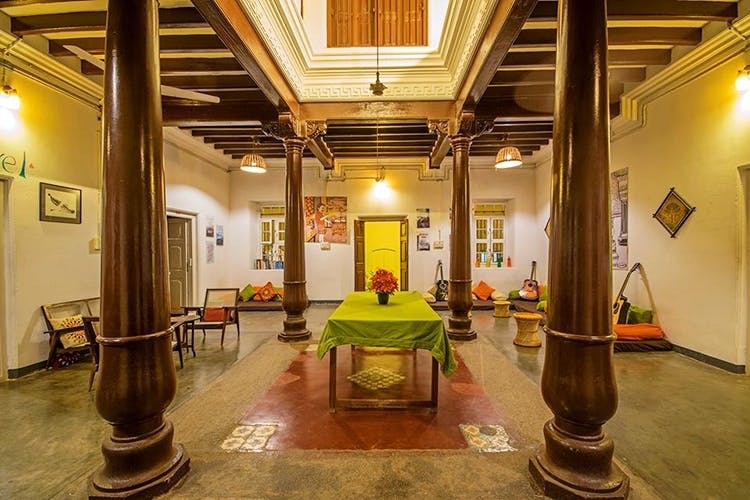 Located just 1.2 kilometres from the Mysore Palace, this house is spread over two floors, with a terrace that doubles as a lounge. The theme of the house in terms of linen and upholstery is orange and green, and the cushions, pillows, table and more are draped in these colours. The walls are decorated with pictures and paintings, and the interiors are large and spacious. You can relax on their terrace with a book, as there is a book exchange facility here or just sit by yourself or with your friends and enjoy yourself. The hotel has free WiFi and some board games too if the technology isn’t your thing on a holiday.The house has an option of private rooms or bunk beds, and it also has 11 bathrooms, so there’s no waiting business involved here. Each bed comes with attached reading light, plug points and adequate storage. All linen is also provided. There’s an attached kitchen for meals, but they are not included in the package. All rooms are air-conditioned and there’s also cable TV and laundry facilities. A bunk in the dorm costs INR 500 and a private room starts at INR 1,400. Dorms have 4 and 6-bed options, with the added female dormitory option as well. Located close to the zoo (800 mts away!) and the Mysore Palace, make sure you soak in the sights and sounds of this wonderful heritage town. You could also go skydiving if you want to check something off the list of things to do!